The Poison Spider Dinosaur Tracks are located along Highway 279, 6 miles west of its junction with Highway 191, near Moab, Utah. Highway 279 is also known as the Potash Road. Besides the dinosaur tracks, that are on several different rock slabs, there are also numerous petroglyphs all along the base of the cliff. The Long Bow Arch trail also begins from the Poison Spider trailhead. 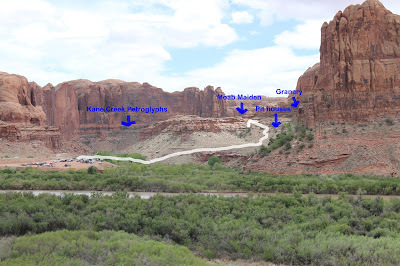 Highway 279 is a paved road so getting to the trailhead and back with ample time to explore the tracks and petroglyphs only adds about 60-90 minutes to a trip to Moab. If you have a couple more hours you might also like trying the short 2.4 mile hike to Long Bow Arch. The best tracks are visible from the trailhead on a rock slab about halfway up the hill. There are a few tracks on some of the other rocks but they are a little harder to get to. As you follow the trail from the parking area it will lead to a fork where the Long Bow Arch trail branches off on the left. Some minor scrambling is required in places on this primitive trail. So, a few million years ago a few Therapod dinosaurs were walking along the beach leaving tracks in the damp sand and more drier sand blew in and covered up the tracks and preserved them while sand continued to pile up causing the layers beneath to solidify into stone. The route from the dinosaur tracks to the petroglyphs wasn't marked very well on the trip where we took the photos for this post. If you climb a little higher up the hill above the tracks you should be able to find an obvious trail on up to the base of the cliff. Once you get up to the base of the cliff there will be petroglyphs right in front of you. You can work your way heading west along the cliff going from panel to panel. This picture was taken looking east down the cliff toward Moab. There are only a few petroglyphs going this way but the shelf is kinda fun hiking along if you want to stretch your legs a bit more. Heading west the whole base of the cliff is pretty much covered with various petroglyphs. These images seem to relate to a dance or festival. There is another large slab of rock with more tracks on it toward the west end of the cliff. A trail marker with some interesting information on it makes them easy to find. If you really enjoy petroglyphs and such there are several other sites close by. One of the easiest to get to was right next to the road as you were driving in. There are others across the Colorado River from here. Some of the best ones are along the high wall on the east side of Kane Creek. If you park at the Amasa Back trailhead you can hike up to the Moab Maiden where you can find not only petroglyphs but the remains of several pithouses and a granary. The petroglyphs along the cliff come to an end as the trail reconnects to the trail that leads to Long Bow Arch. 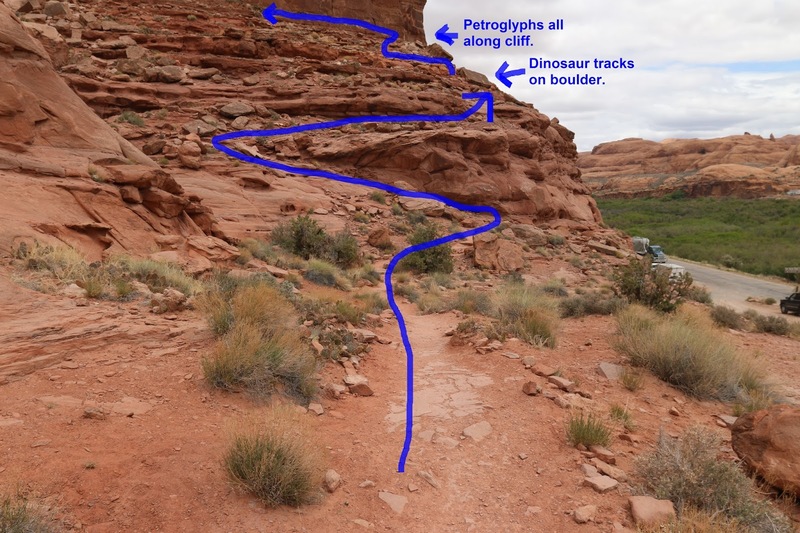 Here you have the choice whether to hike an additional mile to see the arch or head back down the hill to the trailhead. We'll have to warn you though, if you like exploring then you will love the fun to hike trail to Long Bow. It's not too bad when you can see some dinosaur tracks and nice petroglyphs with a minimal amount of effort. Throw in a few arches and scenic canyons with the mix and it gets pretty easy to see what draws people to the area. When we first posted this site in 2015 there weren't any trail markers or kiosks other than right at the trailhead. It was all pretty much guess work trying to find the tracks and the petroglyphs. The extra work that the BLM put in has made it a lot nicer to visit so we decided to take more pictures and repost it with some additional information. If you would like to see it for yourself then all you have to do is 'Take a hike'.